SWEETS hotel offers a radical new way to experience Amsterdam. 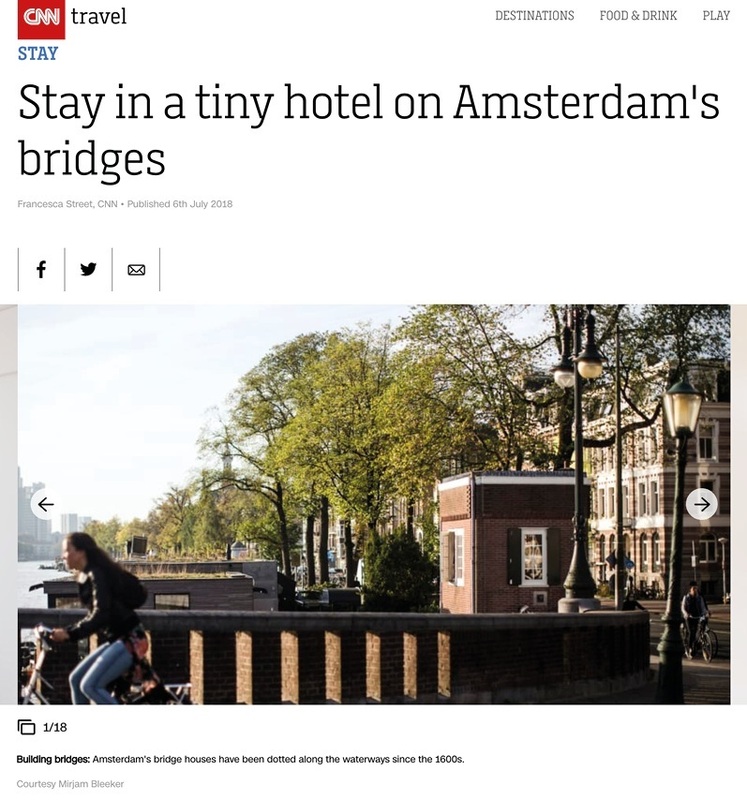 Spread across 28 of the city’s unique former bridgekeepers’ houses, the hotel allows guests to choose from a range of independent two-person mini-suites, all linked together by Amsterdam’s famous canals. The idea for SWEETS arose in 2010. The financial crisis had led to a lot of empty real estate. Large unoccupied office buildings attracted the most attention, but Space&Matter saw potential in these smaller buildings. Because Amsterdam’s bridge control system had been centralised, the bridge watchmen's houses had fallen into disuse. In this collection of buildings, we realised there was an opportunity to create a special new hotel concept, with hotel rooms scattered throughout the city. In order to develop and exploit the hotel concept, we then sought collaboration with the founders of the Lloyd Hotel & Cultural Embassy, Suzanne Oxenaar and Otto Nan (currently known as Seven New Things), and developer Grayfield. The SWEETS hotel was based on the concept of a design hotel with individually designed rooms. We just translated this concept to an urban scale. At SWEETS hotel the city itself becomes the hotel and the different rooms are situated along the canals, the corridors of the city. To reinforce the idea in the pitch to the municipality, iconic sweets were made of all the bridge keeper's houses. Through a collaboration with a moldmaker and Papabubble, a colorful 'box of SWEETS' could be taken to the City Hall. The concept was received with enthusiasm by the municipality. In SWEETS hotel, each bridge house is a unique hotel room, while the canals are the connecting corridors and the hotel is the city itself. Indeed, since the hotel has no central facilities, neighbourhood amenities serve as the lobby, breakfast café or restaurant. In this unique arrangement, guests can experience a different part of the city every booking. The bridge houses vary in size from 12 to 70 m2. As such, each house has very specific design challenges. For instance, sometimes they are almost too small or too angular to place a double bed. Nevertheless, it is always possible to create a bathroom, toilet and comfortable sleeping place. 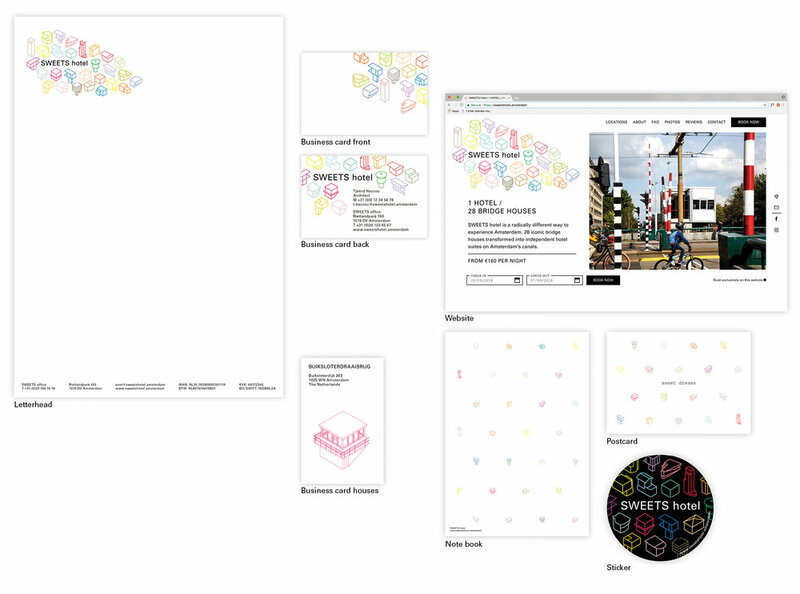 In addition to the concept and the interior, Space & Matter also designed the corporate identity, merchandise (including shampoo, hand soap, tricycle, clothes, umbrella and monument signs) and (parts of) the SWEETS hotel website. Throughout the branding, the iconic bridge houses take centre stage. After the opening of SWEETS hotel, the concept was published all over the world, from an article in The New York Times to items on Chinese and Japanese television.